A large calabur tree downed in a violent thunderstorm blocked traffic in Sattahip for an hour. 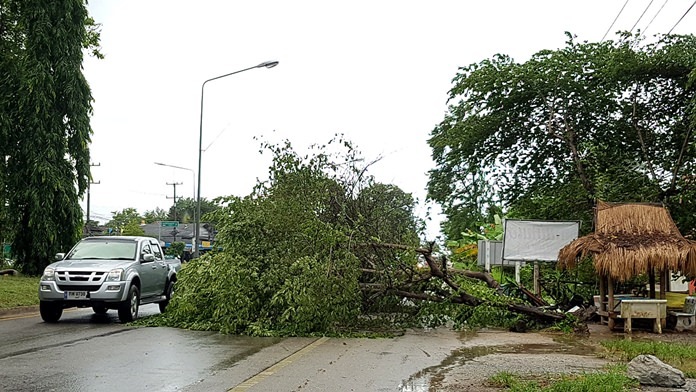 A large tree downed in a violent thunderstorm blocked traffic in Sattahip for an hour. Traffic backed up on Sukhumvit Road in Moo 8 village for a kilometer July 17 when a strong wind gust felled the 10-year-old calabur tree. Khet Udomsak Sub-district workers spent an hour cutting apart the tree, which blocked one lane of the busy highway.